It expresses an opinion. . .
. . . It endorses “repudiation of . . . the politics of fear, intolerance and disinformation” . 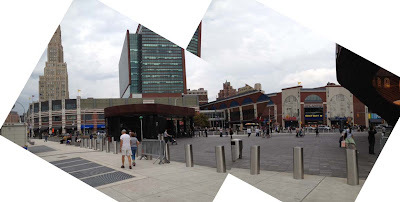 . .
. . .repudiation of “trickle-down economics” . .
Is it Norman Oder’s Atlantic Yards Report? Perhaps specifically his “Atlantic Yards and the Culture of Cheating” series? Certainly sounds like that could be the case and it so easily could be. . . But that’s not what it is. This is just to say, once again, what I keep trying to remind people of: That everything is connected and that the New York Times’ good reporting about so much else is undermined and misses comprehensive perspective when its reporting about the scandals of the Atlantic Yards mega-monopoly is biased, incomplete and poor. In the larger scheme of things it’s all part and parcel of a much bigger story. But wait. . Maybe the Times election outcome editorial doesn’t actually endorse “rejecting the politics of deceit” or repudiating “the politics of fear, intolerance and disinformation.” The style of the editorial is an unusual one that can only be employed at election time: Whatever may be implied and unusual though it may be, at no time does the editorial say what the Times as paper of record thinks. . . It is only recites in favorable-sounding terms what the voters decreed as their state of mind. 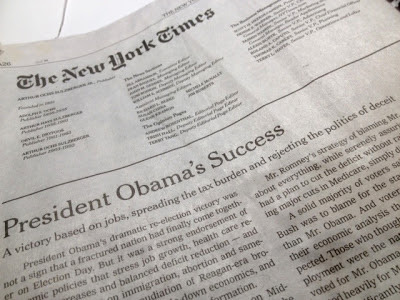 Something else that is interesting: the subheading in the print edition, “A victory based on jobs, spreading the tax burden and rejecting the politics of deceit,” doesn’t appear as part of the online editorial; you can only find it on the web in the teaser summaries leading to it when you search the Times site. That deletion of a reference to deceit is a little like the way we can find ghostly remnants of the article the Times recently deleted that reported criticism of the Ratner/Prokhorov “Barclays” arena when it opened. Coming back to New York Tuesday evening from Philadelphia I finally got a chance to settle down with the New York Times on the train. 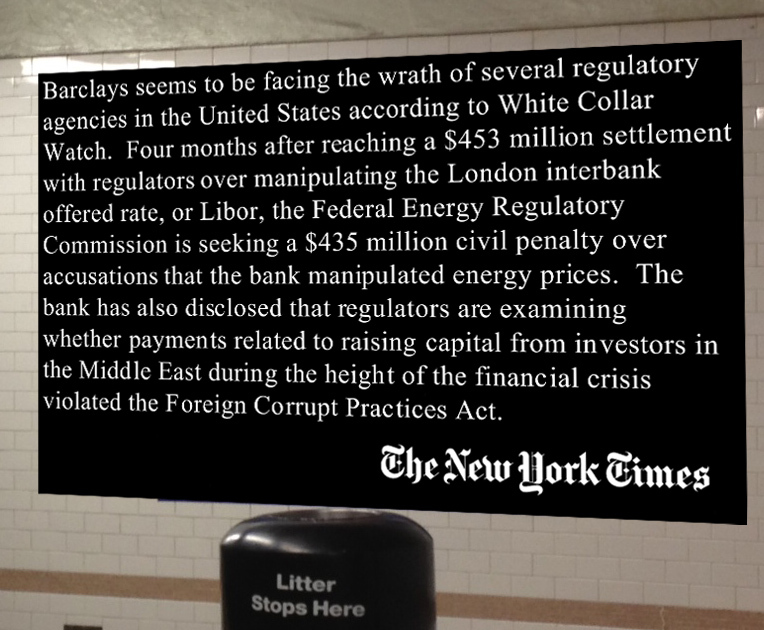 HEAVY SCRUTINY Barclays seems to be facing the wrath of several regulatory agencies in the United States according to White Collar Watch. Four months after reaching a $453 million settlement with regulators over manipulating the London interbank offered rate, or Libor, the Federal Energy Regulatory Commission is seeking a $435 million civil penalty over accusations that the bank manipulated energy prices. The bank has also disclosed that regulators are examining whether payments related to raising capital from investors in the Middle East during the height of the financial crisis violated the Foreign Corrupt Practices Act. The DealBook Online column alerts readers of the print edition to articles that can read in the online edition of the Times. The full online article can be found here: A Triple Whammy for Barclays, by Peter J. Henning, November 5, 2012. The British bank Barclays disclosed on Wednesday that it faced two new investigations by American authorities, including one examining whether the company had violated anticorruption laws in its capital-raising efforts during the financial crisis. The news further hurt the share price as the bank reported weak third-quarter results. The new joint investigation from the Justice Department and the Securities and Exchange Commission on the bank’s capital-raising efforts follows similar efforts by British regulators. The Federal Energy Regulatory Commission is also investigating the past energy trading activity in the bank’s American operations. The commission’s staff on Wednesday recommended taking action against the bank and levying a $470 million fine. Federal regulators are seeking $469.9 million in penalties from the bank, and $18 million from four former traders. Regulators, relying on e-mail evidence, claim that four traders at Barclays manipulated energy prices to profit on swap contracts. One trader said a particular strategy was “fun,” while another said he was “trying to drive price” in his swap bet, according to messages cited by Reuters. In an order filed on Wednesday against Barclays, the commission says some of the bank’s energy traders manipulated electricity prices from the end of 2006 to the end of 2008. 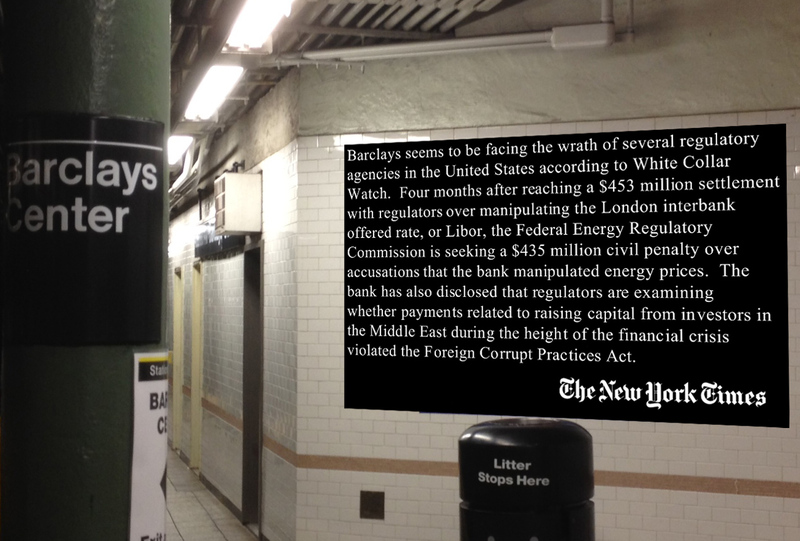 In a regulatory order, the commission is demanding Barclays pay a $435 million penalty and disgorge an additional $35 million. The commission lays out how it thinks the alleged manipulation worked. It says Barclays put on trades that were intended to skew the prices for electricity in what the industry calls the physical market. Those allegedly skewed prices then affected the value of other bets on electricity prices, in the so-called financial market. The Barclays traders, the commission says, were prepared to take losses in the physical market to move the prices of electricity there. The physical bets were “not intended to get the best price on those transactions and was not in response to supply and demand fundamentals in the market,” the commission wrote in its order. 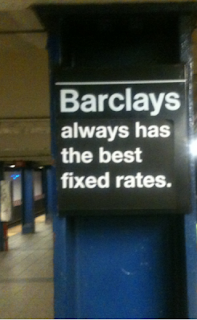 Those allegedly manipulated prices lifted the value of the financial bets Barclays had placed, according to the commission. It also argues that the gains in the financial bets were greater than the losses on the physical trades, effectively leaving Barclays with an overall profit during the period when the manipulation is alleged to have occurred. In the wake of a number of banking scandals, British politicians are examining ways to improve the culture inside the country’s financial services sector. A parliamentary commission is expected to offer suggestions for new legislation by the end of the year. With all this new material, the guerrilla political street artists who are stealthily modifying the MTA’s Barclays branded subway pillars to say things like: “Barclays always has the best fixed rates” and other interesting variations of criticism of the bank are going to have to crank out new editions of their work if they are going to keep pace in educating the subway-riding populace about what they need to know about the multiplying misdeeds of Barclays. Notwithstanding that the real news about Barclays Bank is universally very negative right now, if you go to the Times site and do searches for “Barclays” you will find that the bank's name is busily being burnished at the Times site, see images below (click to enlarge). 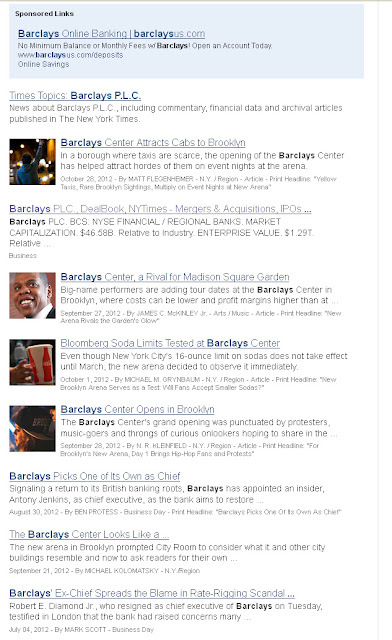 Searches for “Barclays” pull up listed article results that are preceded by paid advertisements for Barclays Bank. 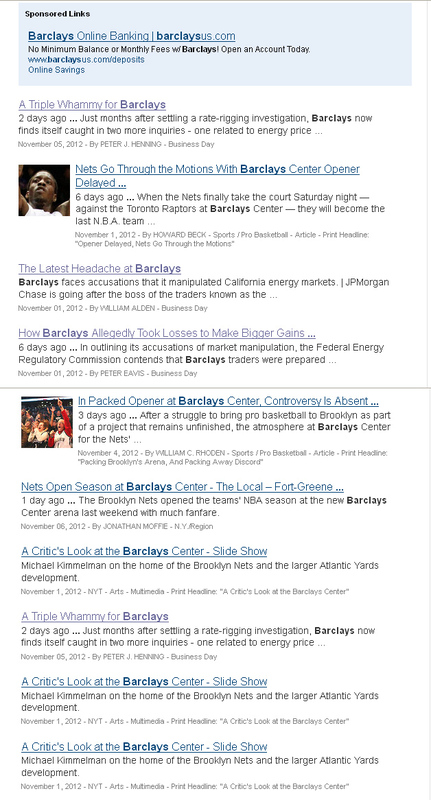 The listed articles themselves are mostly reflective of all the practically full-out positive hype the Times has been giving the opening of the “Barclays” arena including silly and biased Bloomberg administration-assisted stories (at the top of the list) like how the arena is bringing more yellow cabs to Brooklyn (not mentioning the failure to properly handle the black car problems brought to the area by the arena. Even an article that hints at some possible controversy (Sports of The Times: Packing Brooklyn’s Arena and Packing Away Discord, by William C. Rhoden, November 4, 2012) is uninsightful and in the end dismissive of the multiple scandals associated with the arena’s creation itself. The Times has basically buried the scandal about how the MTA gave away the right to brand Brooklyn subway hubs with the name of the bank, never adequately explaining to the public that those rights were given away by the MTA virtually for free. Glaringly, the Times has only three times mentioned the anomaly of devoting vastly valuable public resources and assets to subsidize the promotion of such a questionable bank. I’ve suggested that the mention of this anomaly should be almost routine in the many articles the Times runs effectively hyping the bank’s name. Instead, those articles, like the direct advertising from Barclays you see on the Times site; never mention or hint at the awkwardness. Norman Oder has these two articles available that provide much assessment focused on the Times recent hyping of the arena while its coverage of the related real significant news events languishes: (City Journal) The Barclays Center’s Media Enabler: From the start, the New York Times was reluctant to challenge Brooklyn’s new arena, November 6, 2012 and (Atlantic Yards Report) Wednesday, November 07, 2012, My City Journal essay on the New York Times's record covering Atlantic Yards: "The Barclays Center's Media Enabler". “You’re not buying news when you buy the New York Times,” the late publisher Arthur Ochs Sulzberger once said. “You’re buying judgment.” When it comes to Atlantic Yards, you’re not getting enough. Having one's bank's name on Brooklyn subway hub stations is not a guarantee of good advertising 100% of the time. Monday around rush hour, just after 5:00 PM, I was headed back to Brooklyn from Manhattan’s West Village on the subway when I was subjected to the following announcement: “Because of an investigation at Barclays the following trains are not running to Brooklyn, 2, 3, 4 and 5.” Given that the superstorm Hurricane Sandy had still shut down many other lines (the N, R Q, W etc.) 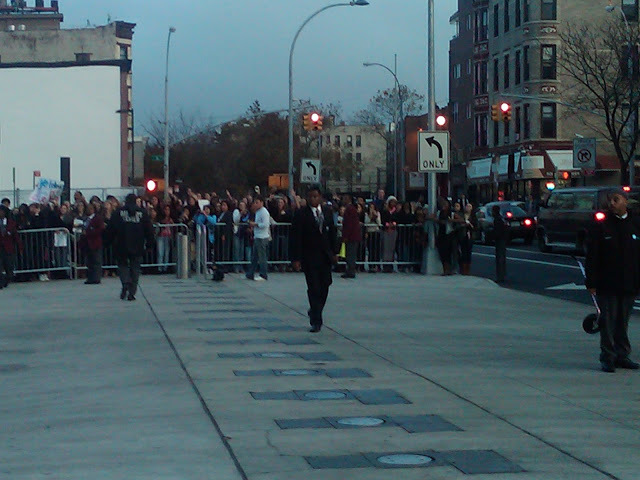 the announcement suggested that the one way to get to Brooklyn that evening was to take the D train. Downtown 2 and 3 trains were being taken out of service when they reached 14th Street. I took the number 1 train down to its current last stop at Chambers Street and walked across the bridge. On my long walk home I couldn’t help thinking how appropriate investigations of “Barclays,” in fact, would be, including investigation of the political confections between the developer/subsidy collectors for the “Barclays” arena and the Atlantic Yards mega-monopoly, which the arena spearheads. Unfortunately, I knew that the investigation going on at Barclays that evening didn’t involve our local politicians ( Mayor Bloomberg, Brooklyn Borough President Markowitz, MTA and ESD Officials, etc) and Bruce Ratner and Mikhail Prokhorov. We can hope that they do in the future.